You've just landed a coveted work-from-home job. This is great news. You can now ditch the time-consuming commute to work. You can avoid office gossip, and you can work on your own schedule. But, there are some pitfalls. It's not always easy to stay productive when you're working from home. There are plenty of distractions — Orange Is the New Black on Netflix, the refrigerator, and your bike just waiting for you in the garage — to take you away from your work. If you're not careful, you might find yourself missing deadlines, angering your bosses and — ultimately — heading back into an office every day. The key to avoiding this fate is to treat your home office more like an office and less like a home, at least during the workday. 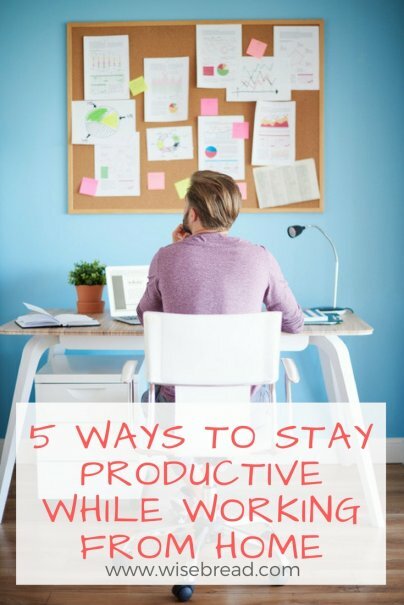 Here are five tips that you can use to remain productive while working from home. Devora Zack, author of the book Singletasking and owner of Only Connect Consulting, a business-consulting company in Bethesda, Maryland, says that you need to keep distractions at bay during the working day. That means creating a workspace that keeps out children, spouses, or any other distractions when you're working. Zack says that it's your job to "build fences" that will keep distractions away. These fences can be anything from a closed and locked door to muting your call-waiting feature while conducting an important phone interview. Andy Abramson, chief executive officer of marketing firm Comunicano, has been working from home part- or full-time since 1974 when he first started handling marketing duties for professional sports teams. The resident of Del Mar, California, says that the key to staying productive at home is to have a schedule for every day, and to stick to it. It helps to have a to-do list, too. That way you won't reach the end of your work day only to find that you didn't complete your most important tasks. "Have a routine if you work from home, and plan your day," Abramson said. "This includes times for taking breaks, running errands, and eating meals." Dani Mackey, owner of Washington, D.C.-based Dani Mackey Communications, says that it's important to leave your home office on a regular basis. It's too easy to cut yourself off from the community if you work from home every day. Mackey suggests schedule meetings when possible outside your office. Leaving the office increases networking opportunities and forces you to dress professionally — it can be easy to dress down every day when you work from home. "It also forces you to be more productive while you are in your office, as there is less time available to be unproductive," Mackey says. It can be easy when you work from home to let email take over your life. It's tempting to check your email while playing with your kids, chatting with your spouse, making dinner, or exercising, especially if you're constantly toting your smartphone with you. Michael Fritsch, the productivity expert known as the SavvyCOO, says that people who work from home should set aside blocks of time specifically to deal with email. They should also use email filters to automatically route messages to specific folders. You might designate emails from your boss or clients to automatically redirect to an inbox marked "Urgent." You can automatically route emails from friends and family members to a different, less-urgent inbox. When you work from home, it can be too easy to spend all of your time on work. But this isn't healthy: You need to schedule time for exercise, reading, and spending time with your family. Elisette Carlson, founder of San Diego-based public relations firm SMACK! Media and someone who works from home, recommends treating these breaks as you would any other meeting or deadline; don't blow them off. "Take a moment in the evening to put it all away," Carlson said. "This has helped me a lot. From 6:30 to 8:30 p.m. is family time. Sure, I'll peek at my phone to ensure there aren't any emergencies, but I try to keep this time 100% about family." How do you stay focused when working from home? One of the benefits of working at home is that most of the time your performance is based on productivity, so when I cross everything off my list for the day, I'm done, regardless of what time it is.